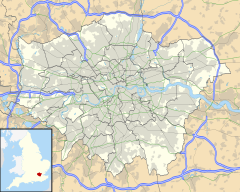 Thornton Heath is an area of South London, England, within the London Borough of Croydon and the historic county of Surrey. It is 7.2 miles (11.6 km) south of Charing Cross. Until the arrival of the railway in 1862, Thornton Heath was focused on an area 1.5 miles (2.4 km) south west of the Whitehorse manor house (now a school), at the locality on the main Sussex road A23 known as Thornton Heath Pond. Between the manor house and pond there was an isolated farmhouse. Eventually it would become the site for the railway station and the main expansion hub. In the 50-year period 1861–1911, Thornton Heath saw a complete transformation from isolated rural outpost to integrated metropolitan suburb. In its infancy, a new railway station sited in the eastern farmlands enabled that immediate area to evolve around a central point. In the late 19th century, the western part of Thornton Heath, which lay directly on the main London-Sussex road, demonstrated a classic form of suburban ribbon development. In the process, it became the final piece in an urban chain linking two major centres, London and Croydon, completing the greatest metropolitan expansion in the world at that time. The nearest places are Mitcham, Croydon, South Norwood, Norbury, Pollards Hill, Selhurst, Upper Norwood and Eastfields. There is a London Bus garage at the junction known as Thornton Heath Pond (although there is no longer a pond) where the A23 Brighton Road splits from the A236 Croydon road. The nearest railway stations are Thornton Heath, Norbury, Norwood Junction and Selhurst. Croydon's Tram system nearby has links to Wimbledon. Architecturally, Thornton Heath is predominantly Victorian in both its residential and commercial sectors. There are a number of imposing, even grand, buildings surviving from this period. Two examples are St Paul's Church and St Alban's Church. St Alban's is an Anglican church and is listed Grade II. Built in 1889, it was the first church designed by the late Victorian architect Sir Ninian Comper. It is situated on a busy junction (of Grange Road and the High Street), as can be seen in the photograph. It is described as being of a red-brick perpendicular style with stone dressing. At the junction of the High Street and Parchmore Road, on a site previously called Walker's Green, stands the Clocktower, which was built in 1900, financed partly by public subscription. However, the Victorian baths did not survive, and were replaced by a modern sports and leisure centre in 2004. It cost £8m with £2.8m from the British National Lottery Good Causes Fund through Sport England. Thornton Heath has a high degree of ethnic diversity. In the 2011 census, the Thornton Heath ward was 25% White British, 21% Black Caribbean and 15% Black African. Bensham Manor ward, which also covers areas of Thornton Heath, was 19% White British, 18% Black Caribbean, 13% Black African and 11% Indian. The area since 2011 has the highest Black Caribbean population (not including those of mixed heritage) in London. Thornton Heath gained a new leisure centre in May 2004 which has proved popular. The popularity was such that turnstiles had to be fitted to improve security. The centre is owned by Croydon Council, but originally run by Parkwood Leisure, and now run by Fusion Lifestyle in partnership with the council. Thornton Heath formerly had a Non-League football club, Croydon Athletic, who played at the Keith Tuckey Stadium; but the club ceased to exist at the end of the 2010-11 season. In 2012, fans of the club formed AFC Croydon Athletic, which plays at the Mayfield Stadium. In 2015 the club competed in the Southern Counties East League. The reformed 5 time FA Cup winners Wanderers FC currently play at Thornton Heath. Thornton Heath is also home to historic rugby club Streatham-Croydon RFC founded in 1871. Their grounds and clubhouse are located in Frant Road off Brigstock Road. Thornton Heath is one of the railway stations used by visitors to Crystal Palace's Selhurst Park stadium. Thornton Heath Community Action Team was formed in 2014 by a group of residents and businesses. Its aim is to deliver projects to improve the area. This has included organising litter picks, planting of new plants, and a community Christmas tree. ^ "Thornton Heath Leisure Centre". Huntley Cartwright Charted Quantity Surveyors. Retrieved 13 September 2009. ^ a b c d e Menhinnitt, Daniel (30 June 2004). "New centre success". The Croydon Guardian. Newsquest Media Group. Retrieved 13 September 2009. ^ Menhinnitt, Daniel (3 November 2004). "National Lottery's benefit to the borough". The Croydon Guardian. Newsquest Media Group. Retrieved 13 September 2009. ^ "Thornton Heath - UK Census Data 2011". ukcensusdata.com. Retrieved 31 October 2017. ^ "Bensham Manor - UK Census Data 2011". ukcensusdata.com. Retrieved 31 October 2017. ^ "Hurry for tickets to see Manchester Utd". The Croydon Guardian. Newsquest Media Group (via Factiva - subscription required). 10 November 2004. Retrieved 13 September 2009. ^ "London Borough of Croydon: Thornton Heath Leisure Centre". London Borough of Croydon. Retrieved 13 September 2009. ^ "Thornton Heath Community Action Team". thorntonheath.net. Retrieved 31 October 2017.